The Gardens Community Garden (GRA) at Doncaster Gardens, off Green Lanes N4 is one of the best community-run green spaces in the country – and that’s official! 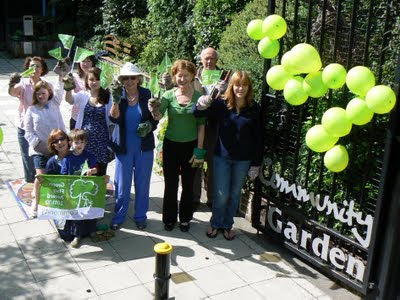 Today, The Gardens Community Garden (GRA) will receive the Community Award, a sign that the site is a well- managed and welcoming place, central to the local community and is a high-quality green space in Haringey which is run and managed completely by unpaid volunteers through the local residents association. The Gardens Community Garden (GRA) is one of a record number of parks and green spaces receiving the Community Award this year, ensuring that even more of us now have access to well-managed, high-quality green spaces. Andy Newman - The Gardens Community Garden Co-ordinator who is also the Vice Chair of the Gardens Residents Association is truly over the moon with this years award as this is the 6th time in a row that the Gardens Residents Association (GRA) have won the award since 2006 – “We were recently awarded funding from the Big Lottery to commission local willow artist “Angela Baker” to produce willow artwork incorporating bird boxes, which have made an fantastic visual impact in the garden this year. We try to fundraise and install something different into the community garden every year so it’s constantly evolving and growing”. The garden is like the “Oasis of the Gardens” in Harringay and the garden is used like a Community Centre without a Roof, for birthday parties, outdoor films, Easter egg hunts, Halloween events, even christenings and once was used for a funeral. Phil Barton, Green Flag Plus Partnership chairman said: “I would like to congratulate this year’s winners, who have worked hard throughout the year to keep their parks and green spaces at a high standard and ensure they are pleasant and enjoyable spaces for the whole community. 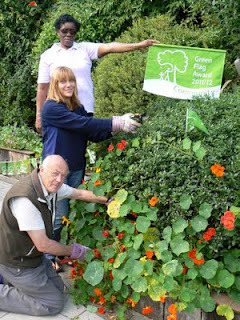 “The Green Flag Award Scheme, and its growth, is essential in driving up the standards of our parks and green spaces. Access to quality green space is something we all desire and the scheme plays a key role in providing it.